Sometimes the invitro will fluff up a bit and keep growing when you birth, but it might abort if you're dunking. Maybe I'm getting too far ahead of the process? 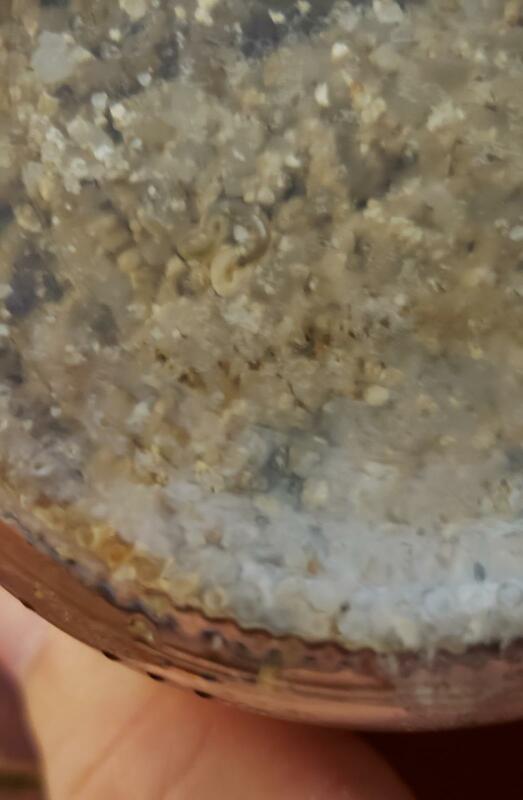 Besides the one obvious fruit, there's not really any signs of pins... should I maybe wait a bit longer? 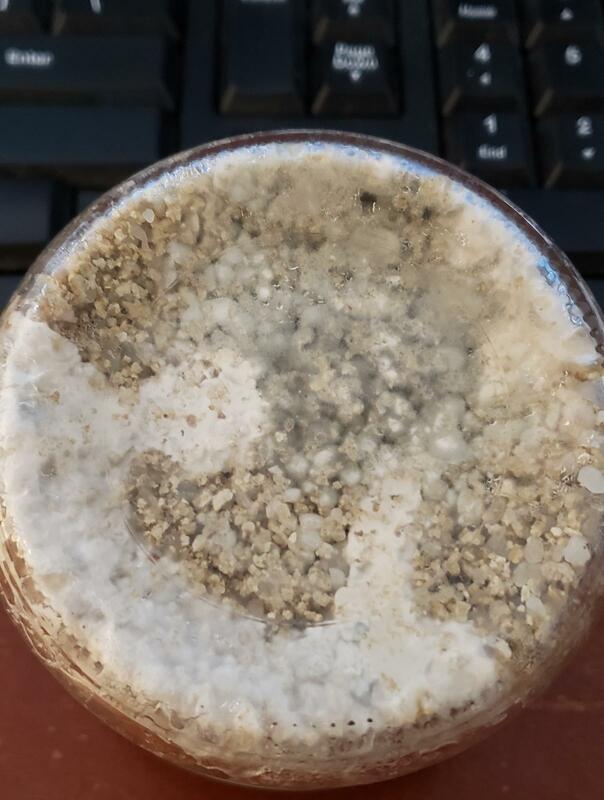 That grey/blue you are referring to might just be myc, Treasure Coast can grow nearly white fruits and in my experience with the strain it blues easy from just about anything, too dry, too wet, bumping up against or pressed against the jar, etc. This seemed especially true of BRF cakes. What do you think, my Mycotopian mates? 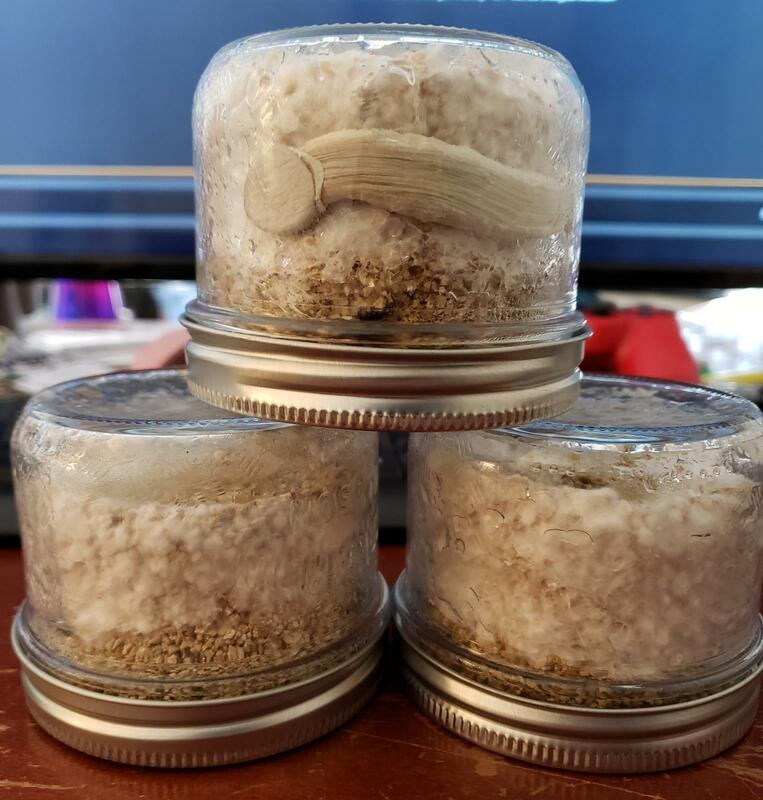 Should I birth the jars today or wait a bit? 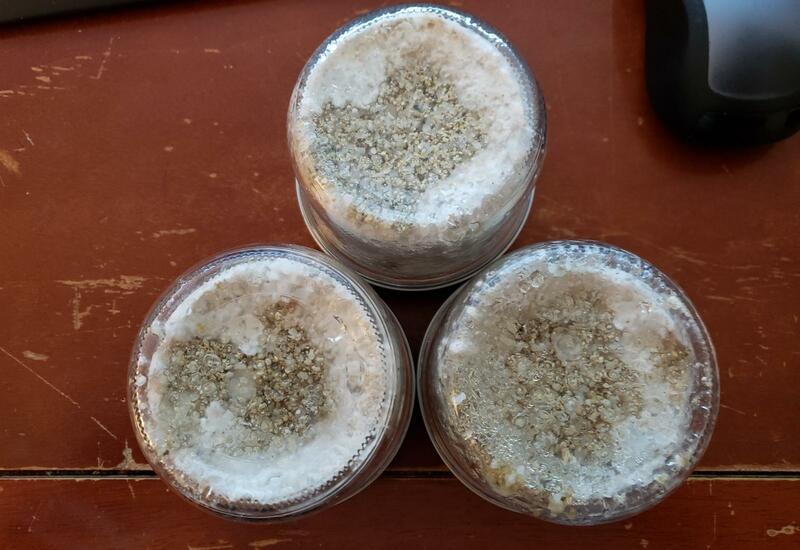 I can't tell much from the pics above, the three jars, the first one does look a little off white, but again, I've seen this before where it appears wispy and not quite white but then as it "filled in" the myc became apparent. Maybe my old eyes are at fault, but I can't quite tell what you're dealing with so I hesitate to offer anything more than observations and commentary based on my own TC grows. I'd not want to steer you wrong, do you think perhaps you could take a pic or two of the first one from a couple of slightly different angles , perhaps with the lighting at different angles ? I want to see if the grey(gray ?) in the center looks like myc or perhaps is fuzzy or furry looking. Agreed, the pics are a little blurry. I would wait a few more days and if no more colonization happens or any funky colors arise, toss um. Thanks for the tips, everyone! Sorry about the blurry pics: I'll try better next time. The other 3 are still going strong. 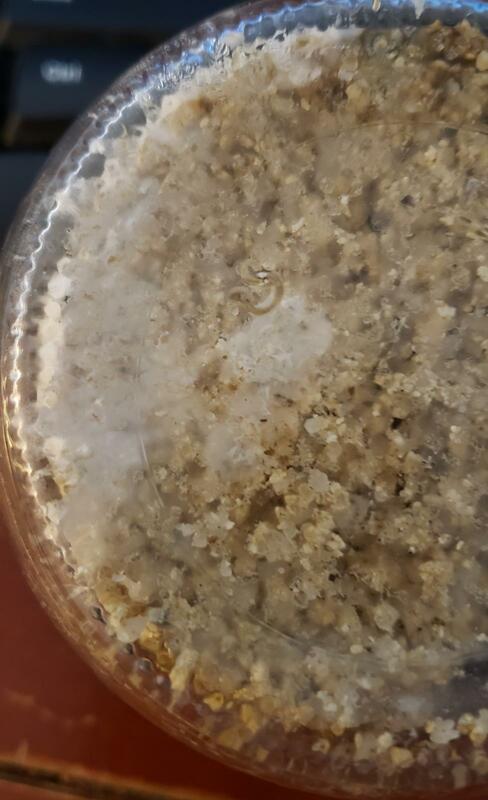 While no more mycelium growth seems to be happening, they do seem to be pretty well-developed! I am pretty sure I should be birthing them today. I was unsure about doing it, but today, I feel that if I leave them any longer, I will lose them. 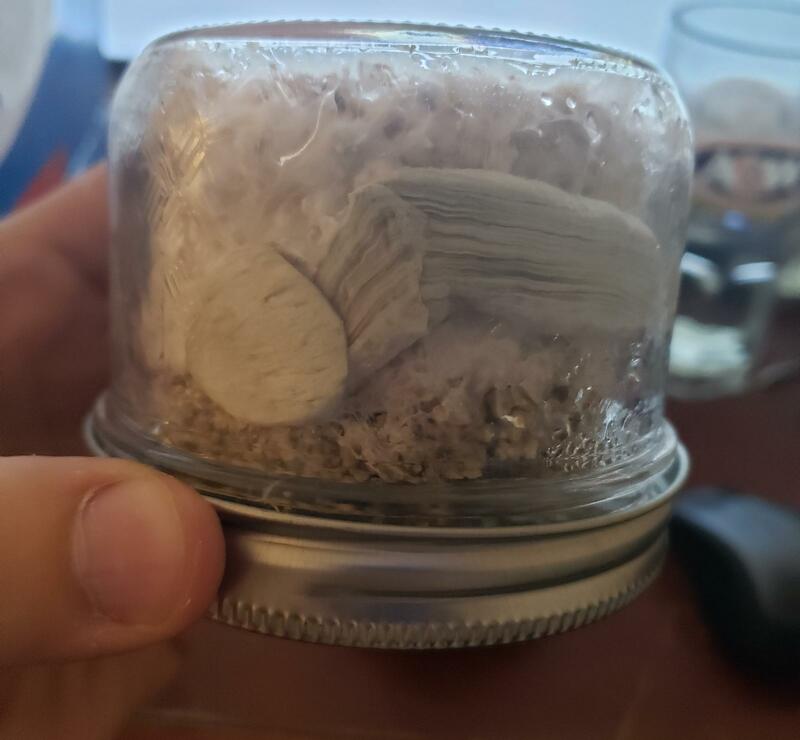 The one with the fruit on it has made the decision for me, since it is now twice as thick and stretches halfway around the jar. I'm going to pick it and then rinse and dunk, tho I fear in doing that I will damage them, since I don't know how the center has developed. Edited by OldAndMiserable, 09 February 2019 - 11:41 AM. Can you post a recent pic? All the other pics I have taken were done the day of their posting, tho I know they are a tad blurry at times. Hopefully this one works! I am not a cake grower, although I often use cake material as substrate. But the top one with the invitro fruit, I would definitely birth and not dunk it. If I am wrong about the dunking on that cake, please cake growers correct me. The bottom on the right looks fully colonized, but the one to the left isn’t quite there. Better pictures and all looks good from my couch. Just IMO, I'd leave the jar with the fruit in the jar another couple days until you see the veil start breaking, then pick, dunk if needed, and fruit in the FC from there. The other 2 previous post gave good advice for the rest. So, am I right in thinking the veil has ripped? Gosh darnit... I hate choices!!! Patience or work... well, I think I'll leave them till the morning. Get them dunked while I drink my coffee. If a jar is showing grey that's 1 more excuse to wait til the morning. If that cake goes bad, you're not going to want to dunk it, with the others especially. I really like how that TC has such little color. Very cool. I'll leave them until the morning. I took off their sleeping bags I used for added warmth (read: old socks), to see if that helps. Edited by OldAndMiserable, 10 February 2019 - 02:33 PM. The jar on the right, though, is a bit easier to ID. 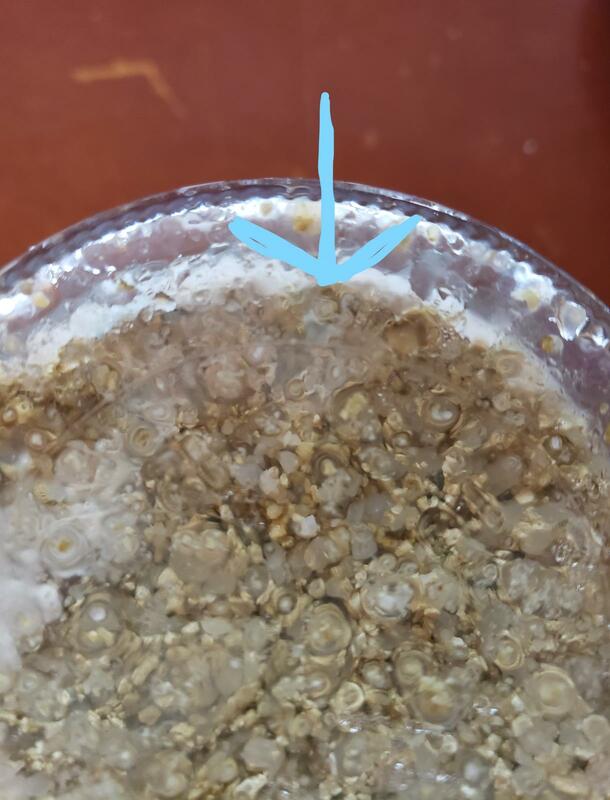 It looks like blueing to be, most likely caused by stress from the excess moisture and metabolites...its hard to tell though. 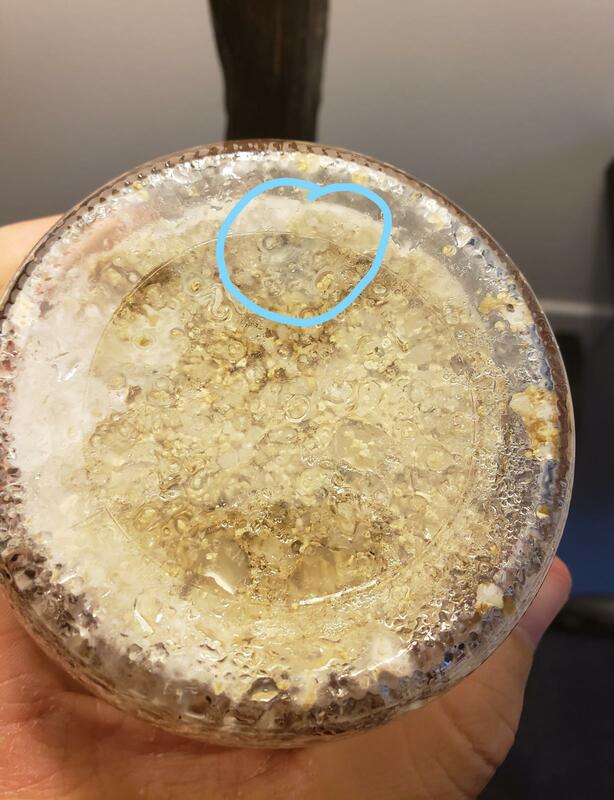 It might be mold. A day should give you more obvious answers. I think we all forgot to mention that bacterial jars tend to smell like old sweaty socks, or just bad in general. Don't go breathing into jars that aren't finished, but the smell is pretty noticeable if you waft the air toward you or take a quick whiff. Edited by Deleena24, 10 February 2019 - 03:21 PM. Guess it doesn't help that I've been using socks to keep them warm! I haven't noticed any smells yet, so I think they should be fine. Tomorrow will be the deciding factor, for sure! 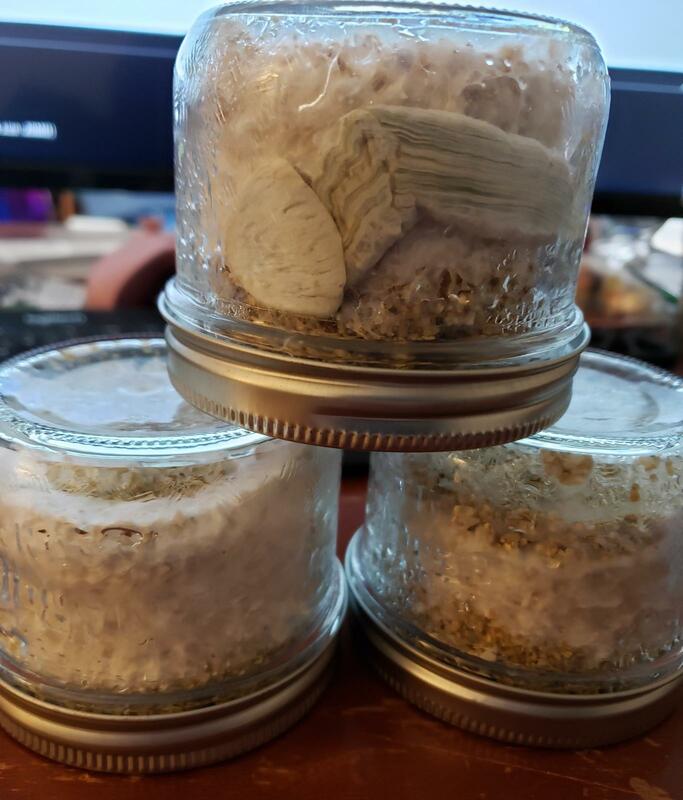 Doesn't seem like the mycelium has thickened much, but it would appear the fruit has grown! There's still a bunch of condensation in the jars, tho. What if I take them out, rinse them, and then put them back in the jars? I could then screw the lids on loosely and submerge them in water, allowing the water to fill the jars. Would that work?